I hope you are enjoying this wonderful time of year where the flowers are blooming, the grass is green, the days are long and wonderful fragrances fill the senses! I work from home most days in Massachusetts and I tend to get a bit of cabin fever during the winter. Thankfully I have the opportunity to head to Tanzania via Amsterdam and escape the cold and darkness of winter at the end of January. This year I departed Boston on schedule a cold January evening…little did I know, I would never make it to Tanzania. Fifteen minutes after landing at Schipol airport, in Amsterdam I was doubled over in pain, unable to move. I spent 5 days at VU medical center in Amsterdam. I was released only to go back to Boston for some more medical tests. It was determined that I had an unexplained pancreatitis attack in Amsterdam; which I think a change in diet ignited. Three weeks later I attempted Tanzania again. I was a bit apprehensive walking through Schipol Airport, but made it this time without a glitch. But I was four weeks behind schedule. My first objective when I first arrived was to get the little house we built livable. No water, no electricity, no doors and no ceilings…and a bat infestation welcomed me. I couch surfed with a lovely couple for the first three weeks and commuted everyday, working with contractors, furniture makers, plumbers, electricians etc. With still so much to do, my hero husband arrived just in time to help finish what was started. His arrival freed me up a bit to work on the school and check off the many government requirements one by one. It was an awesome three weeks. The young workers gave Bruce the name Babu, which means grandpa, saying he is so strong, as they were secretly hoping for a 15 minute break. We still don’t have electricity which we are dependent on the government to supply. It took us one year to get a survey and I have been advised recently that it could be another six months before the three poles are put in place, even though we paid for them in April. This makes running a school very difficult: no printer, no desktop computers, no copier, no wifi, no lights and limits me any and all administration work. The house and more is coming together and we were getting closer to meeting most of the governments updated requirements. We planted over 250 bougainvilleas, put up a fence, built a shelter for our watchmen, planted dozens of trees, added a rest area to all our classrooms, a reading corner, updated all of our dishes, cups and bowls, added cabinets to our school kitchen with only a few more minor things to do. In March our Mango trees were in full bloom with thousands of fresh mangoes, we had many visitors, helping themselves to the harvest! Everyone ate mangoes for weeks, even the monkeys. In January the Government notified us that we need to change the name of our small and growing school. Since we are not a religious organization, we could no longer use the name St. Nicholas. They independently changed it to the name of the village which was not acceptable to us. “Mlangarini School” last week it was finally corrected to the new name we chose and we couldn&apos;t be more excited about it! Fr. Christmas Academy. The name now clearly stating that we celebrate the joy of Christmas everyday, as we give the gift of education all year long to children. Thinking about coming to Tanzania? Please contact us! We could create an awesome itinerary with some cultural tours and a safari… and our students love visitors! Since I have been back in the Boston area I have hit the ground running, having steady electricity and unlimited wifi. I have been busy raising funds through our Tanzanian art initiative and could be found at educational, leadership and teacher conferences on some weekdays and on the weekends I set up at festivals and arts markets. I raised over $10,000 in the past six weeks! Our volunteers at Gillette stadium are also working hard to support our students and we have four concerts and the NE Patriot season upcoming. I have caught up on most of our administrative work: bookkeeping, budgets, website upgrade, SEO, Google Ads, Grant writing and finally this newsletter! 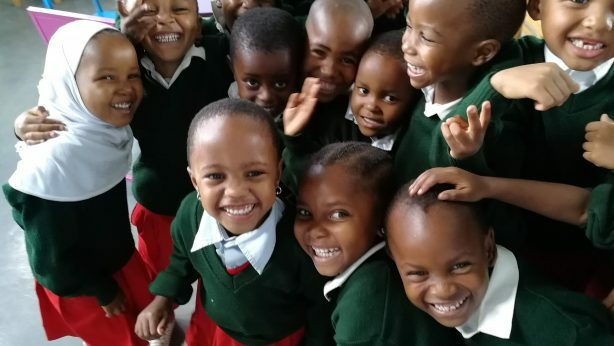 I have been working with Rotary Clubs who want to support education in Tanzania, and work with us to change a the lives of impoverished children too. We are excited about all of our partnerships! We have two capital campaigns going on at the moment: additional playground equipment and classroom furniture as well as student sponsorship’s check on any of these links to add your piece of the puzzle. Your support is so much vital to our work. For a limited time we are giving our beautiful hand made TSF coaster for all donations of $25 or more by the end of June 2018. Become a proud supporter of our work and display our coaster in your office or home and protect your desk from hot coffee/tea cups! Click here to donate $25 and receive your gift! I am attending a three day nonprofit collaborative this week in Boston, and will surround myself with other nonprofit leaders attending workshops, lectures, discussions and networking that will hopefully reenergize me. My apologies for not sending out this update earlier, however fundraising and compliance have been my main objectives. I head back to Tanzania next week. I am at two arts markets this weekend in Boston, Greenway Open Market on Saturday and Sowa on Sunday, if in the area, please stop by! I look forward to increasing the amount of funds raised for our students! Thank you so much for all you do! We wouldn’t be where we are today without you!